As a Registered Investment Adviser I’ve heard two questions over and over again in the last couple of weeks. What do you think the market will do in 2019? – What are your goals for 2019? LET’S TALK ABOUT GOALS !!! Both questions are intertwined and here is my “two cents”. I believe more people will lose money in 2019 as they set their primary goal to make back EVERYTHING they lost in 2018. Ego loses people money just as easily as fear and greed. There are no guarantees in the market and there is no proof the market will bounce back next year. It would be great to make back everything you’ve lost but a profit is still a profit. You don’t go broke by taking profits! You don’t go broke by collar trading! I would hate to see anyone in the market think they know more than the market does and try to outguess the market. It just doesn’t make any sense at all to put on risky trades to make back what you’ve lost in a week, month or last year? Let me introduce you to the idea behind being S.M.A.R.T. in your goal setting. S. – Simple, Specific, Schedule – Keep it simple stupid just like old acronym says – KISS. Set a simple return just like you set your primary exits in your trade. Decide on a specific amount (I will talk about this later) and write it down. Schedule it in your planner! Remember your schedule is to make that return over a year’s period not in the month of Jan or in the first half of the year. Make sure you see your goal on a daily basis as you check you schedule on a daily basis. M – Measurable – Most people set what is called a “pinpoint” goal. We might decide that we want to make a simple market average return of 7% in a 1 year period. What happens in real life? We hit the goal and then we Quit or Stop trying as hard. Set a range goal. Maybe you always want a minimum return of 7%ish so set your goal to be between 7% to 20%. On the bullish years 7% is easy so I set a goal so If you do make it you still have something to shoot for. A – Attainable – Make a plan to how you will attain your goals. Start this step by asking yourself what or who do you want to become? ie… a better trader, a full time trade, a stay at home dad, a millionaire. Too may people at the start of every year write down a wish list not a goal. I wish at the end of the year I can make this amount of money or lose this amount of weight. How will you do it and what will you do to get there? How much of your portfolio will be safe in collar trades? How much will be pure option strategies? How much will you use for vegas trades? Will you use margin to reach your goals? Figure out the details to how you will get to where you want to be at. Start with the end of the year goal on Dec 31st and walk yourself backwards. T – Time – Set the time period that you want to accomplish your goals. Set short term, intermediate, long term, and life long goals you want to reach and hold your self accountable. Let others know the time period you expect to reach your goals and get the support needed to get there. Whether it is between you and your spouse, your kids, your parents, your education program or maybe the good Lord himself, find support during the tough times. I promise you they will come. Asia Pacific markets started the trading week with gains despite China reporting that its economy grew at the lowest official pace in 28 years. China’s economic growth came in at 6.6 percent in 2018 — the slowest pace since 1990. That was in line with expectations from economists polled by Reuters. Fourth quarter GDP growth was 6.4 percent, which was also in line with expectations. The world’s second-largest economy grew 6.6 percent in 2018, which matched analysts’ expectations, and was lower than a revised 6.8 percent growth in 2017. Fourth quarter GDP growth was 6.4 percent, which was also in line with expectations. Chinese President Xi Jinping and U.S. President Donald Trumpagreed to a 90-day pause in tariff escalation at the G-20 summit in Argentina late in 2018. The mainland Chinese markets, closely watched as a result of the ongoing U.S.-China trade fight, saw gains on the back of the data release. The Shanghai composite rose more than 0.5 percent to close at about 2,610.51 while the Shenzhen composite gained 0.607 percent to end its trading day at around 1,330.17. The Shenzhen component also advanced 0.592 percent to close at approximately 7,626.24. Hong Kong’s Hang Seng index saw gains of 0.39 percent to close at 27,196.54. Ford Motor: Outsized Return Potential In 2019? While being a major underperformer in 2018, Ford Motor could outperform in 2019 on the back of recovering investor sentiment. 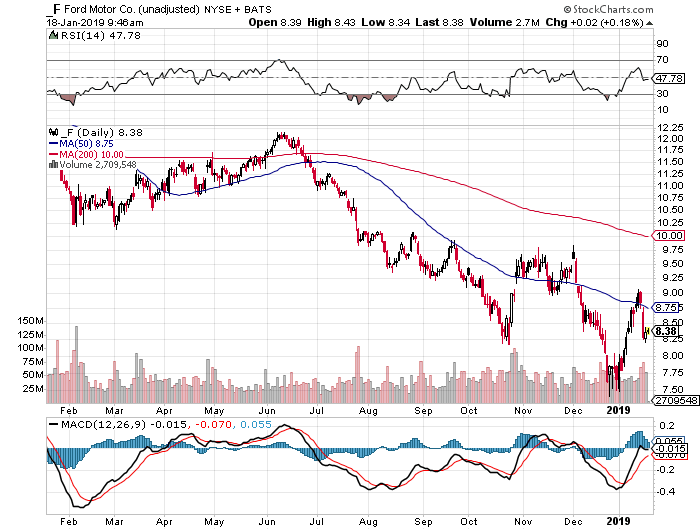 Ford Motor has huge surprise potential due to lowered investor expectations. Shares remain in the bargain bin. An investment in F yields 7.2 percent. Ford Motor‘s (F) shares could outperform in 2019 on the back of improving investor sentiment in the stock market. Ford Motor’s shares remain grotesquely undervalued based on earnings projections, and 2019 is likely going to see some normalization in the trade relationship between the United States and China. An investment in Ford Motor currently yields 7.2 percent and comes with considerable upside potential. Ford Motor’s shares have not exactly been at the top of investors’ shopping lists in 2018: Ford Motor was (and still is) at the forefront of the trade war between the United States and China, and higher tariffs have caused both Ford Motor and General Motors (GM) to lower their earnings forecasts last year. The tariff stand-off between the two largest economies in the world and lowered earnings projections have heavily weighed on the auto sector. On the back of deteriorating investor risk appetite for auto companies, Ford Motor’s shares fell to a new multi-year low @$7.41 in December. That being said, though, Ford Motor’s shares have bounced back from their most recent lows, thanks to improving investor sentiment. Ford Motor’s management has previously guided for its earnings to fall into a range of $1.30-$1.50/share which would mean Q4 2018 EPS will be at the lower end of the previous guidance range. Ford’s preliminary earnings release comes after General Motors issued a bullish outlook on its business which I discussed in my article titled, “General Motors: This Is A Game Changer“. General Motors’ shares popped after the auto company raised its earnings and free cash flow guidance for 2019. Ford Motor did not yet release its earnings guidance for the 2019 financial year, but will likely do so on January 23, 2019. Ford Motor did, however, declare a stable $0.15/share dividend for the first quarter. The Q1 2019 dividend will be paid on March 1 to shareholders of record at the close of business on January 31. The U.S. economy does not slide into a recession. Should these conditions be met, Ford Motor could recapture a lot of the territory it lost in 2018, and shares could trade back up to the $11-$12 price range. Since shares currently change hands for $8.36, implying ~32-44 percent upside potential. Today, Ford Motor is still widely undervalued, in my opinion, with shares selling for just 5.3x next year’s estimated earnings, making the company even cheaper than General Motors. Obviously, a cyclical economic downturn (implying contracting U.S. vehicle sales, lower consumer spending) and a continued trade confrontation with China without a trade deal are major risk factors that could derail the investment thesis. That said, though, investors also could earn high risk-adjusted returns if the U.S. and China come to a trade agreement and the U.S. economy doesn’t run out of steam in 2019. General Motors’ outlook for 2019 was very bullish and Ford Motor will likely issue an earnings forecast next week when it reports earnings. A trade resolution, which I think we are moving towards slowly, will likely be a major positive catalyst for Ford Motor’s shares. The low price investors pay today for Ford Motor’s shares implies a favorable risk/reward, and it tilts the odds in favor of investors earning high risk-adjusted returns going forward should the U.S.-China trade conflict be resolved. Freeport-McMoRan has had a difficult time over the past six months due to difficult commodity prices, however, the company has an impressive portfolio of assets. 2019 and 2020 should be transition years for Freeport-McMoRan before the company emerges much stronger in the early-2020s. This will reward investors well. I continue recommending investing in Freeport-McMoRan for the next 5 years, as a top tier investment. Freeport-McMoRan (NYSE: FCX) is a more than $16 billion mining company with a significant portfolio of assets, especially in the copper business. Just over a year ago, I made the company my top mining pick for the next 5 years. The company had a difficult 2018 however, due to a difficult commodity environment. Despite this, the company’s asset portfolio still makes it my top mining pick for the next 5 years. To properly analyze Freeport-McMoRan, we need to start by looking at the markets the company operates in. Like all other commodity companies, the company is subject to price fluctuations in what it sells. For those interested in the oil markets, another popular commodity, I recommend looking at my 2019 oil market outlook. The above shows the performance of the copper markets. Like all other markets, copper prices took a healthy nosedive in late-2018. Current copper prices are roughly $2.85 per pound down from $3.20 per pound in the first half of 2018. This difficult drop in copper prices put a significant blip in the earnings of Freeport-McMoRan. Despite this, overall, global demand remains healthy. U.S. construction and manufacturing remain positive and the European market remains steady. At the same time, there are constraints for scrap processes. Copper, due to its cost, is readily recycled. As a result, an oversupply in scrap can also be something that impacts copper prices. Long-term the fundamentals in the copper markets remain strong, which should impact Freeport-McMoRan. Freeport-McMoRan believes a significant supply gap is approaching, and such a supply gap could lead to prices going up in the coming years. This could be a significant benefit for Freeport-McMoRan. One of the things that makes me believe that a supply gap is approaching is the graph above. 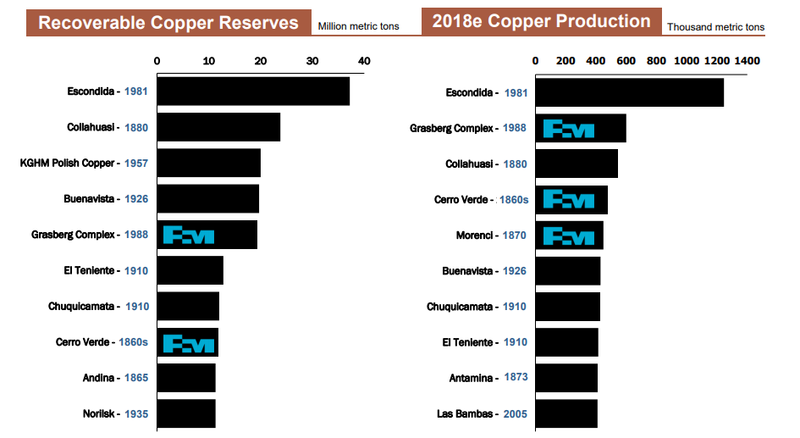 This graph shows significant copper discoveries recently, with none of the 10 largest mines in terms of copper reserves discovered in the past 30 years. In fact, a significant percentage of the largest mines were originally discovered in the 1800s. In terms of the largest mines by production, a number of the larger ones were discovered roughly 30-40 years ago. 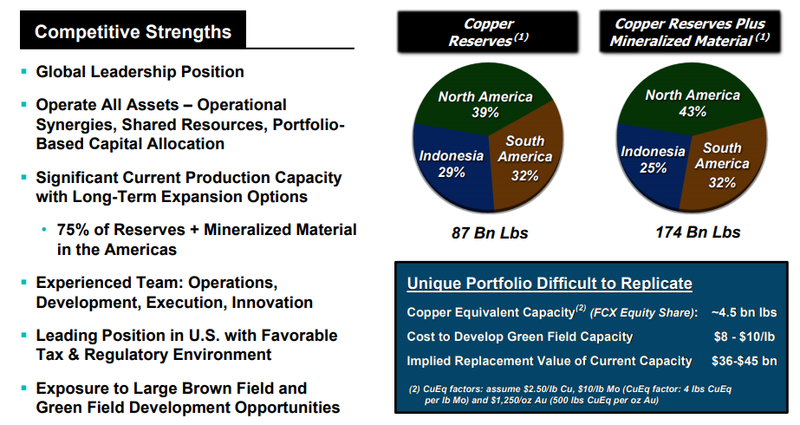 Another significant thing to note is where Freeport-McMoRan is located on this graph. The company has 3 of the 5 largest producing mines in the world and 2 of the top 10 largest mines by reserves. 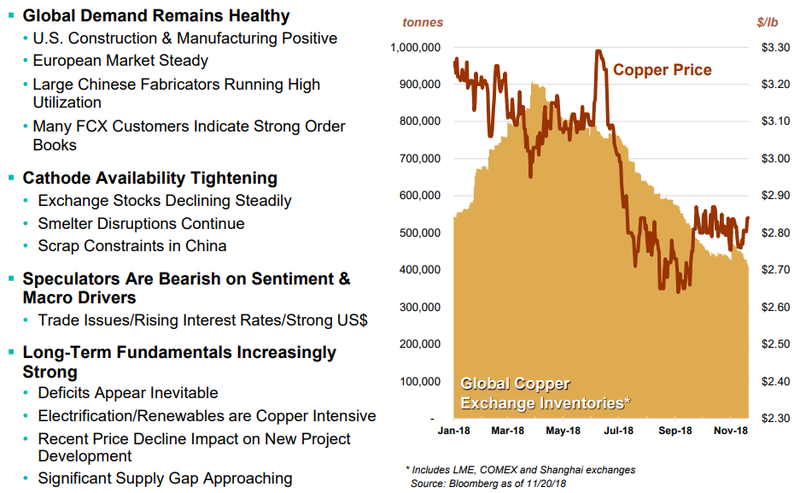 As a result, if worldwide copper demand continues to grow while no new supply is coming online, this means that copper prices should recover. We discussed the company’s assets a tiny bit above, but let’s continue by discussing the company’s global footprint. This is essential to making the company my top mining pick for the next 5 years. Freeport-McMoRan has a global leadership position and operates all of its own assets. The majority of the company’s assets have been quantified and the company has significant production capacity at the present time. On top of this, the company has significant long-term expansion options. On top of this the company has an experienced team and leading position in the U.S.
Freeport-McMoRan copper reserves alone are massive. The company has astounding 87 billion billion pounds of reserves, worth almost a quarter of a trillion dollars at current prices. This is a massive portfolio of assets, and is worth approximately 15 times that of Freeport-McMoRan. Overall, Freeport-McMoRan’s impressive portfolio is incredibly difficult to replicate. The implied replacement value of the company’s current capacity is $36-45 billion. That’s more than double the company’s market cap, and it actually means Freeport-McMoRan’s assets are so impressive the company would be a good acquisition target, for a large company looking to expand. At the same time, Freeport-McMoRan has continued to invest heavily in expanding this asset base. One of the company’s major projects is the Lone Star project in Arizona. This massive project being located in the United States is a strong benefit in my opinion; this is a large commodity project and being in a stable government environment will help it to provide reliable cash flows. The project will cost $850 million, of which $200 million has already been incurred. At the same time, the project has a NPV @8% of $1.2 billion at $3.5 per pound copper. Keep in mind that current copper prices are $0.7 per pound below this, so this NPV has the chance to drop significantly. At the same time, the project is expected to start up at YE 2020 with a 20 year mine life. At the same time, the company has been focused on ramping up the PT-FI underground mine. This will result in a few years with lower production. Going in the long term, copper production will pick up in the underground mine, which has higher reserves, but gold production will drop down. This means that Freeport-McMoRan is moving more towards a long-term company. 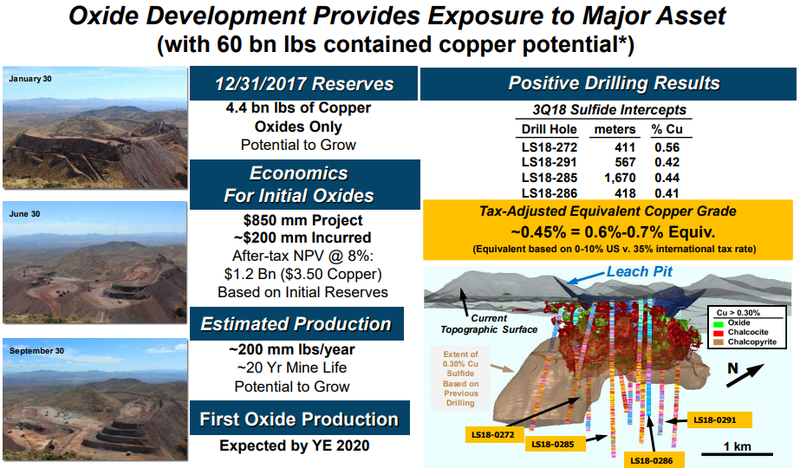 Looking at anticipated production from 2022-2027, the company anticipates roughly 1.7 billion pounds in annual copper production and 1.8 million ounces in annual gold production. This means an astounding $7.1 billion in revenue over this six year period, compared to $6.9 billion in 2018. This shows that while the mine will have some uncertainty, it has long-term potential. Another important thing to keep in mind is that the Grasberg Mine has been significantly de-risked. Freeport-McMoRan has come to an agreement with the Indonesian government which will provide the company with rights until 2041, with no significant change in fiscal terms. This will provide a continued long-term future for the company and this asset. Freeport-McMoRan is in a growing environment, and at the same time, the company has an impressive asset base. Together, these things will be the key to what makes the company my top mining pick for the next 5 years, and that’s the company’s future cash flow. 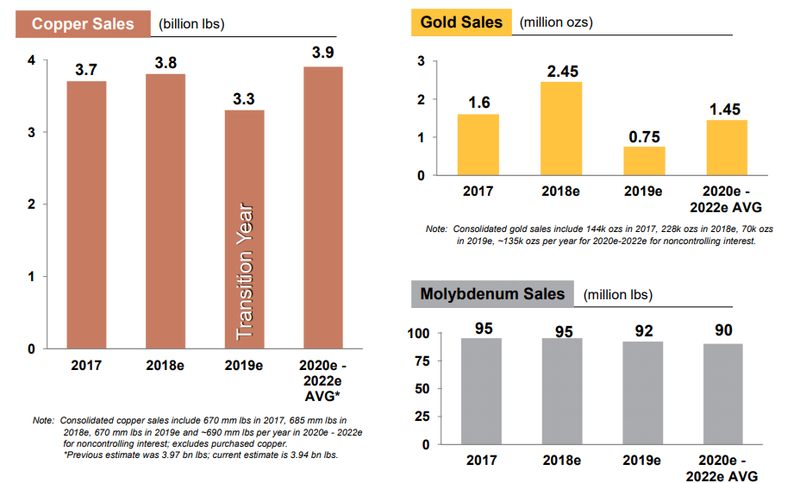 This shows Freeport-McMoRan’s anticipated sales profile in the coming years. As can be seen, Freeport-McMoRan is anticipated to have a rough 2019 as it reorganizes its portfolio. 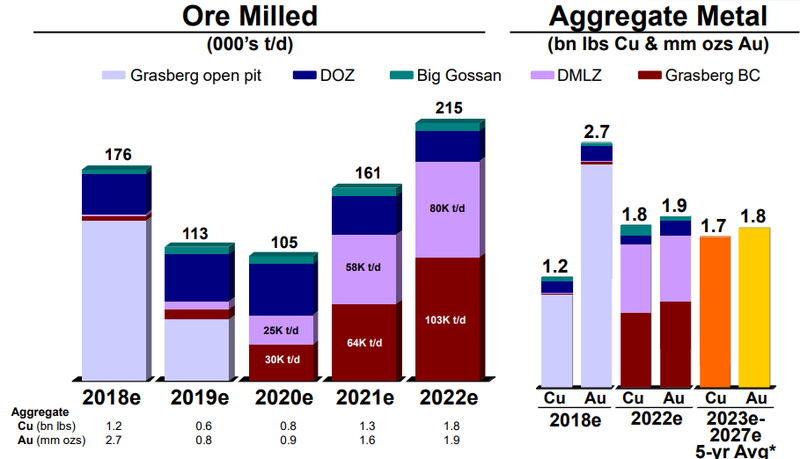 However, going into the early-2020s, especially as the Lone Star project picks up and Grasberg gets more organized for copper, the company’s copper production will increase as gold drops. The company’s anticipated 2020-2022 revenue will be double-digits lower than 2017 revenue, and in line with 2017 revenue. This will result in 2020-2022 revenue of roughly $14 billion. That’s incredibly strong revenue for a company with growing margins and a market cap of >$16 billion. This is incredibly exciting to see for Freeport-McMoRan. To gain a more accurate picture of Freeport-McMoRan’s earning potential, the map above shows Freeport-McMoRan’s average EBITDA and operating cash flow for 2019-2022 at a variety of prices. 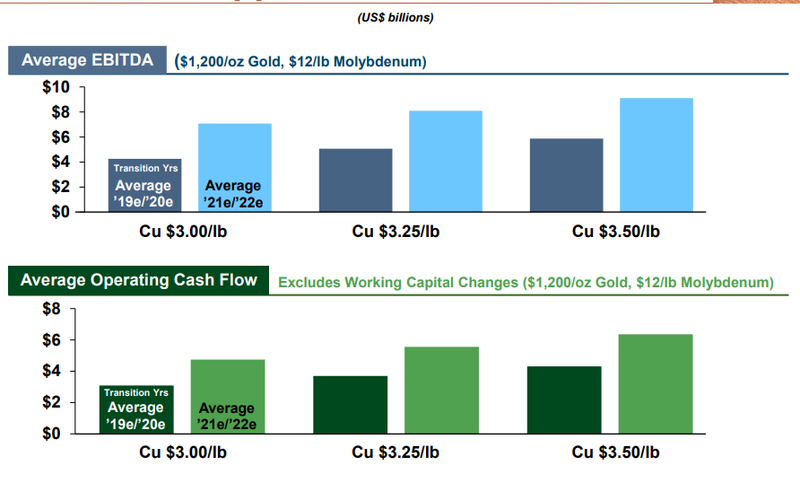 The operating cash flow excludes working capital changes and is based on $1200/oz. Gold and $12/pound Molybdenum. For reference, before we go into this next discussion, current copper prices are roughly $2.7 per pound, current gold prices are roughly $1300/oz, and current molybdenum prices are almost $12 per pound. Let’s start with Freeport-McMoRan’s $3.00 per pound copper prices. Here the company anticipates 2019-2020 operating cash flow of $3 billion per year increasing to more than $4 billion per year from 2021-2022. Using current prices, 2019-2020 we’ll see operating cash flow of $2.3 billion at current prices increasing to $3.6 billion from 2021-2022. It’s important to note that both of these numbers are still incredibly strong cash flow for a company with a market cap of $16 billion. At the same time, the company’s capital expenditure has been growing to $2.0 billion in 2018 and $2.3 billion in 2019. This continued capital expenditure should support increased earnings going into the 2020s and onwards. Freeport-McMoRan has net debt of $6.6 billion and has worked to significantly improved its deleverage. The company’s significant improvement in its financial position has allowed it to continue returning money to shareholders. At the same time, the company has reinstated a quarterly cash dividend on common stock that is close to 2%. The company has more than enough financial capability to continue increasing its dividend and I think it’s really a testament to all that Freeport-McMoRan has accomplished. 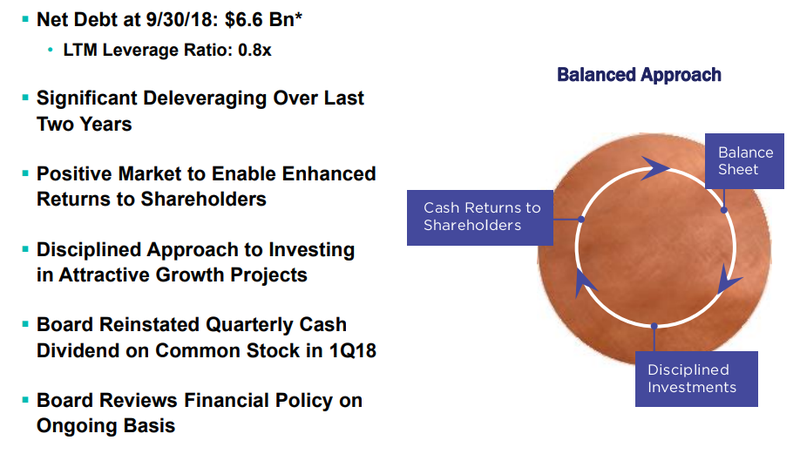 Let’s look at this five year plan for Freeport-McMoRan, which makes the company my top mining pick for the next five years, in terms of cash flow. As can clearly be seen, Freeport-McMoRan has more than enough cash flow to cover its dividends, especially when the company finishes reorganizing business. The Freeport-McMoRan of the early-2020s will be earning $3.6 billion in cash flow, paying out less than 10% as dividends to give a 2% yield, and have a market cap of just $16 billion. This helps to highlight why the company is my top mining pick for the next 5 years. Freeport-McMoRan has had a difficult time over the past six months, but the company has continued to focus on improving its portfolio. The company’s strong portfolio of assets has resulted in growing cash flow, and this past year, the company initiated a dividend. At the same time, the company has continued to focus on aggressively paying down debt. Freeport-McMoRan has managed to solve the issues with the Grasberg project, with negotiations with the Indonesian government being solved until 2041. At the same time, the company’s Lone Star project should be coming online in the early-2020s. This will result in Freeport-McMoRan’s production and earnings stabilizing starting in the early-2020s. Six months later, still no CEO announcement. Growth expected to slow considerably in 2019. Where’s the company going next? As earnings season is about to start very soon, one of the names I’m most looking forward to hearing from is chip giant Intel (INTC). The company is entering an important part in its history, but this time it’s not one from a product or financial standpoint at first. When we get earnings in a couple of weeks on Jan. 24, it would be nice to hear that the company has settled on a permanent leader for its future. What Should I Do With My Intel Shares? Quantitative Analysis of Intel shares using the power of free cash flow. Analysis of Intel from a Main Street vs. Wall Street perspective. 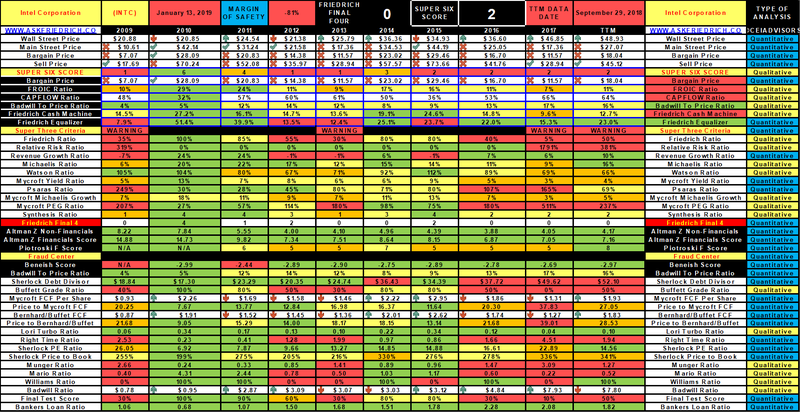 Shows the reader how to do a similar analysis on their own portfolio holdings. That is all well and good but what should Intel investors think about this report? Should they hold until Intel’s earnings report comes out and then sell into the rally, knowing that a potential revenue shortfall will arrive once the shortages end? In this article, I will not discuss the various operations of Intel and how each is doing, as you can read many such articles on Seeking Alpha, both pro and con. What I will simply do is a quantitative analysis of Intel’s results on Main Street and then relate them to what an investor should do on Wall Street, using zero emotion. Let us now go and analyze Intel and find out what our Friedrich algorithm has to say about all this. In analyzing Intel, we will present some unique ratios that our Friedrich Investing System uses and will present a real-time quantitative analysis that will demonstrate the power of free cash flow in the investment process. In doing so, we will also teach everyone how to analyze one’s portfolio holdings on Main Street vs. Wall Street. At the same time, we will explain how the methodology involved in this analysis came about. Main Street is where Intel operates, and Wall Street is where its shares trade. The Intel shares that one can purchase on Wall Street are traded publicly on exchanges and the company has little control over how each share will trade. Intel is required to release its earnings reports each quarter and, from time to time, it also provides press releases to its shareholders (and the general public) giving updates on how its operations are doing on Main Street. Main Street is where Intel invests in its own operations and sells to its customers. How well the CEO of Intel and its management do in selling those products determines how profitable the company will be. Wall Street then reacts based on the success or failure of management to meet its goals. Main Street and Wall Street are thus interlinked, but because anyone with a computer (or even just a smart phone), an internet connection, and a brokerage account can buy or sell any stock at any time, expertise is not a requirement in order to invest on Wall Street. Having noticed this problem some 35 years ago, I spent the last three decades building an algorithm called Friedrich. Our algorithm was designed to assist all investors (both Pro and Novice alike) and give them the ability to quickly compare a company’s Main Street operations, to its Wall Street valuation (Overbought or Oversold condition). 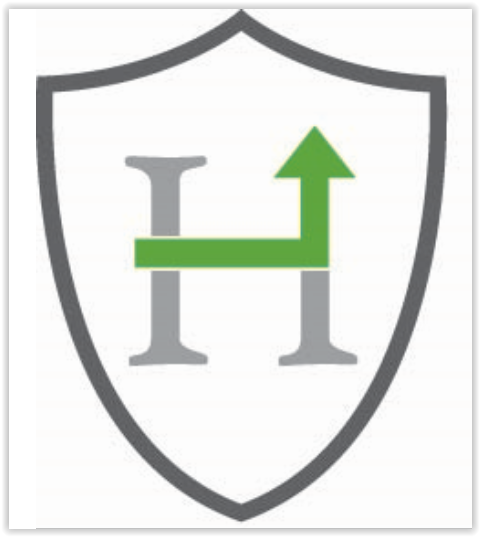 Friedrich can do this on an individual company basis or assist users in analyzing an entire index like the S&P 500, an ETF, Mutual Fund, or individual portfolio with the use of our Portfolio Analyzer. [Owner earnings] represent [A] reported earnings plus [B] depreciation, depletion, amortization, and certain other non-cash charges… less [C] the average annual amount of capitalized expenditures for plant and equipment, etc. that the business requires to fully maintain its long-term competitive position and its unit volume. I have used the free cash flow ratio for decades, using data from the Value Line Investment Survey, whose founder was Arnold Bernhard. Mr. Bernhard was a big fan of free cash flow and probably introduced it sooner than Mr. Buffett did. I know this as I was able to calculate the FCF ratio using old Value Line sheets for my 60-year backtest of the DJIA from 1950 to 2009. The backtest mentioned above demonstrated that if one can purchase a company whose shares are selling for 15 (or less) times its Price to Free Cash Flow Ratio, that the probability of success will dramatically increase in most cases. I have renamed the ratio the Bernhard Buffett Free Cash Flow ratio in honor of both men. The following is how that ratio is calculated. The above are the ratios I use when analyzing a stock on Wall Street, and below are the ratios I use when analyzing a stock on Main Street. The FROIC ratio tells us how much forward free cash flow we can expect the company to generate on Main Street relative to how much total capital it has employed. So, if a company invests $100 in total capital on Main Street and generates $20 in forward free cash flow it, therefore, has a FROIC of 20%, which we consider excellent. This is just one of the key ratios (66 in total) that we use to identify how a company is performing on Main Street, as it is our belief that if a company is making a killing on Main Street, Wall Street will eventually take notice. So let us begin our analysis and at the same time try to teach everyone how to do a similar analysis on one’s own portfolio. In analyzing Intel’s Price to Bernhard Buffett FCF ratio, we must first adjust Intel’s Wall Street Price to account for its debt using our Sherlock Debt Divisor. Below is a detailed definition of that ratio and how we use it. A major concern that I have these days in analyzing companies is the debt burden relative to its operations and whether management is abusing this situation by taking on more debt than it requires. Debt, when used wisely, allows for what is called leverage, and leverage can be extremely beneficial within certain parameters. On the other side of the coin, the use of debt can also be excessive and put a company’s future in jeopardy. So what I have done to determine if a company’s debt policy is beneficial or abusive is to create the Sherlock Debt Divisor. What the Divisor does is punish companies that use debt unwisely and rewards those who successfully use debt as leverage. How do I do this? Well, I take a company’s working capital and subtract its long-term debt. If a company has a lot more working capital than long-term debt I reward it but punish those whose long-term debt exceeds its working capital. So if this result is higher than the current stock market price, then leverage is being used and the more leveraged a company is, the worse the results of this ratio will be and the less attractive its stock will be as an investment. Thus, having successfully defined the Sherlock Debt Divisor, we need the following four bits of financial data in order to calculate it for Intel’s TTM (trailing twelve months), which is as close to real-time data as we can get, based on when each company reports. The current analysis is taken from the Intel September 29, 2018 filing with the SEC (except the Market Price per share). Since Intel has more Long-Term Debt vs. Working Capital, we, therefore, must punish it and use the new $52.09 as our new numerator in all our calculations. Now, if one goes to our FRIEDRICH LEGEND (on what is considered a good or bad result), you will notice that our result of 28.46 is considered average, while anything under 15 is considered excellent. We last ran our data file for Intel on January 13, 2019, and our Friedrich Algorithm gave a recommendation to our subscribers that Intel is “overbought” as our Friedrich Data File and Chart below shows. There you will also find the last ten years of Intel’s Price to Bernhard Buffett Free Cash Flow results. Now that we have taught everyone how to calculate our Price to Bernhard Buffett Free Cash Flow ratio, let us now move on and teach everyone how to calculate our FROIC ratio. Now, if one goes to my FRIEDRICH LEGEND again (on what is considered a good or bad result), you will notice that our result of 11.36% is considered good and tells us that Intel produces $11.36 in forward free cash flow for every $100 it invests in total capital employed on Main Street . On Main Street, Intel is doing good, while on Wall Street it is considered overbought. Going forward, Friedrich is not a big fan of Intel at the moment, as its free cash flow relative to its Market Price makes it overbought. Citi’s analyst may be onto something in that Intel’s price action may continue to be strong, due to the expected double ordering coming from PC chip shortages, but then he expects revenue shortfalls, about a month or two later. Therefore, it seems that if one owns Intel shares, his advice is to hold it and then sell into any rally that may result. Friedrich tends to agree as he feels that Intel’s shares are overbought or overvalued relative to its current price and valuation. In conclusion, it is my belief that free cash flow analysis is the ultimate tool when analyzing companies, and my hope is that you may add these ratios to your own investor toolbox in order to help you in your own due diligence. If you have any questions, please feel free to ask them in the comment section below. Sometimes, no movement is good movement. In the case of the government shutdown, money manager Larry Glazer believes it’s favorable for Wall Street — at least in the short term. His reasoning: It prevents lawmakers from passing policies that could be detrimental to corporate America. The Dow Jones Industrial Average and S&P 500 Index are up more than 10 percent since the shutdown began on Dec. 22. Despite Glazer’s optimistic view on the gridlock, he doesn’t believe it’ll flow through to the corner office. He believes CEOs will use the government shutdown as a negative trend in their earnings announcements. “I really worry, however, that during earnings season companies begin to use the shutdown and China trade as an excuse to sandbag earnings and to lower the bar and lower future forecasts,” he said. According to Glazer, opportunity would follow the negativity. But, his bullish case comes with a caveat. “In no way is the shutdown good for the overall economy if it never ends,” he added. Since it’s not his base case, Glazer, who manages more than $3.5 billion, is sticking with the view that both sides of the aisle will resolve the shutdown. “Gridlock can be okay as a general backdrop. Washington isn’t the center of the universe, believe it or not for the financial market,” Glazer said. Disney’s acquisition of Fox could be completed here sooner than some investors might think. Disney continues to have pricing power in its growing ecosystem. Disney’s upcoming streaming service along with nationwide 5G rollout could build momentum for the stock in the back half of 2019. As the Walt Disney Company (DIS) looks to complete its acquisition of the majority of Twenty-First Century Fox, Inc.’s (FOX) (FOXA) media assets before the first half of 2019 ends, it will finally free the stock for more meaningful moves over the rest of the year. Disney continues to improve wages for its workers, theoretically helping to create better theme park experiences, along with a steady stream of price increases as demand for park access shows little sign of slowing. With ESPN+ showing good growth since its introduction last April, and the upcoming highly anticipated Disney+ streaming service to be spotlighted at the upcoming April 11 investor meeting, investors have a lot to get excited about over the coming year, especially if the nationwide rollout of 5G continues with few hiccups. According to the merger documents for the majority of Twenty-First Fox’s assets, investors receiving New Fox stock and Disney stock from the transaction (instead of $38 in cash plus New Fox stock) will be protected by a collar in the agreement that protects them from price fluctuations in Disney’s stock over the course of closing the deal. Fox shareholders are scheduled to receive an exchange ratio equal to $38 divided by the average Disney stock price over the last 15 trading days before closing unless that average is above $114.32 or below $93.53. If it goes above $114.32, then the exchange ratio will be 0.3324 whereas, if it goes below $93.53, then the ratio will be 0.4063 for shareholders. This has helped keep Disney’s stock rangebound over the past year even as the volatility in the regular stock market has been pretty remarkable over the past year. With the merger most likely being closed sometime in the first half of the year, or maybe even sometime in Q1, this collar on the stock will be lifted freeing Disney to trade on its own investor sentiment again. Brazil, one of the last hurdles left to clear, is expected to approve the merger without any further divestments as early as January 30th when it comes back from year-end recess. This would be great timing with Disney’s Q1 report scheduled to be reported on February 5th. No major regulatory hurdles exist for Disney any more as the United States, Europe, and China have all conditionally signed off on the deal along with general shareholder voter approval for the deal last summer. Disney is currently focused on exploring options for the full sale of its regional sports nets as a conditional part of its merger agreement. Disney might end up selling the 22 regional sports networks as a whole, in a few groups, or it might choose to sell off a majority 51% stake in them and spin off the rest to shareholders. No matter what Disney ends up doing, the sales process seems to be nearing an end along with regulator approval. Once Disney is free of its collar, it will be more likely to trade on recent company news such as the latest price increases at its California theme parks. This double digit price increase comes in preparation for the opening of its new Star Wars attractions opening this summer, which are likely to draw big crowds if it is anywhere near as successful as its Harry Potter attractions were in its Florida parks in 2010 and 2014. To go along with the price increases, Disney has also made it a priority to hike the minimum wage of its Walt Disney World employees to at least $15 an hour by 2021. These salary increases should help create some better park experiences for customers while the new attractions continue to drive high demand across its parks. Disney is looking to create an immersive ecosystem of entertainment as it moves from traditional movies, parks, and cruises into more intense experiences for its customers with its newest attractions along with the move more directly into the home via its new upcoming Disney+ streaming service alongside its current ESPN+ service. Disney will highlight its streaming services at its upcoming investor day along with how ESPN+ is doing with its 1 million customers to date and its hopes for maybe around 5 million subscribers in the first year for its Disney+ streaming service. Both of these services might greatly benefit over time from Disney’s recent partnership with Verizon (VZ) to explore 5G innovations. The next-generation broadband wireless looks to have peak transmission rates for Disney’s StudioLab of 10 gigabytes per second. This will make for some great movie making innovations along with phenomenal mobile video and attraction experiences for customers over time. Both Verizon and AT&T (T) have tested 5G in larger markets with a nationwide rollout planned by both over the course of 2019 and beyond. If all goes well, 5G will help Disney shoot movie scenes at remote sites far easier along with giving customers the ability to download full digital movies in seconds. Virtual reality and AR should also become far more usable from its parks to its cruises as low latencies are key to great customer experiences. Creating exceptional experiences will be one of the keys to Disney’s future success as it seeks to go head to head against its streaming competition from companies like Netflix (NFLX) and other services in 2020 and beyond. Disney’s stock has been rangebound for far too long and is ready to test new highs and lows as the self-imposed collar from the Twenty-First Century Fox deal comes to a close in the first half of 2019. I see a lot of upside potential in Disney’s stock as its new attractions are driving user engagement along with pricing power as it continues to build a more immersive ecosystem set to expand even more into customers homes with the advent of its streaming services alongside the nationwide rollout of 5G services. While uncertainty over its streaming services will bear close watching in the years to come, the upside for Disney’s stock is appealing at this time as the market is always a forward looking entity. I am looking forward to the close of the Twenty-First Century Fox deal when I will again have an oversized position of Disney stock in my portfolio. Best of luck to all. Disclosure: I am/we are long FOX, T. I wrote this article myself, and it expresses my own opinions. I am not receiving compensation for it (other than from Seeking Alpha). I have no business relationship with any company whose stock is mentioned in this article.